At one time in the history of astronomy Earth was thought to be unique. However, as science progressed and older doctrine weakened its grip, Earth moved from being at the very centre of the Universe to more of a supporting role in a huge cast of astronomical objects. Only recently has it become technically possible to begin to observe other planets as they orbit far distant stars and the current total of extrasolar planets stands at 169. One of the detectives hunting down planets outside our Solar System is Dr Peter Wheatley from Warwick University. He is a founder member of the WASP team, an acronym for the Wide Angle Search for Planets which began back in the 1990´s. This wide-angle telescopic system was first tested on the island of La Palma in 2000 when it successfully saw a distant star´s light dim as a large planet known as a "hot Jupiter" passed in front of it. In this case the transiting planet in question is one and a third time the size of Jupiter but orbits so close to its parent star that it is thought that its atmosphere boils off, giving it a tail much like a comet. As other universities have joined the project, generating more funds, its scope has grown as has its name. Now known as superWASP (www.superwasp.org), it will soon be fully operational on two sites; one in each hemisphere. The northern site is still at La Palma and began observing large swathes of the sky in 2004. The southern site is well underway and has recently taken its first images of the night sky from the South African Southern Observatory near Sutherland in South Africa. Both observatories now have eight CCD cameras, each with a 200mm Canon telephoto lens, and generate gigabytes of data every clear night. Each of these small observatories look a little out of place next to the white hemispherical domes of their neighbours. The long white rectangular sheds are made of reinforced fibreglass with a taller section housing the cameras and the adjoining room containing the computers. The stepped roof may be built to withstand high winds and even be heated to avoid a build up of ice but each observatory has its own weather station just in case. 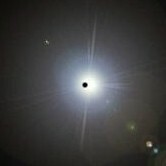 SuperWASP is not alone in its search for other planets as there are around 20 other groups using similar techniques. However, it does cover the widest area of sky and hence the greatest number of stars. In fact the main problem is not too few transits but too many, most of which are due to stars dimming each other´s light and not a planetary transit.